Therapeutic riding uses equine-oriented activities for the purpose of contributing positively to the cognitive, physical, emotional and social well-being of people with disabilities. Physically, it’s the horse’s movement that has a dynamic effect on the rider’s body. The horse stimulates the rider’s pelvis and trunk in a manner that closely resembles a human’s normal gait. This movement can produce specific physical changes in the rider: improvement in posture and balance, increased strength, and normalized muscle tone. Sensorially, the movement of the horse can help with a variety of sensory integration issues. A smooth-gaited, consistently paced horse provides needed input to help a rider establish rhythm. A rough-gaited horse may provide a rider with the stimulation to help organize and integrate sensory input. Movement exploration while on the horse helps improve overall body awareness. Emotionally, the success of overcoming fear and anxiety, and the ability to achieve a riding skill helps a rider to realize self-worth and increase self-esteem. The relationships that develop between riders, volunteers, horses, and staff are integral to the positive emotional experience at Lovelane. Cognitively, the horse provides many riders with the motivation to learn new things. 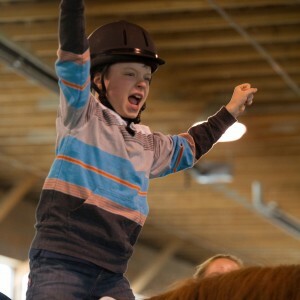 Educational goals such as letter recognition and sequencing can be incorporated into riding activities. Socially, therapeutic riding enables individuals to interact with instructors, volunteers and their peers in a group activity. Riding and the related games and exercises can be both fun and challenging. What does a horse leader do? A horse leader is responsible for leading and managing the horse during the lesson, which includes leading the horse during mounting, dismounting and the lesson. The horse leader is responsible for tacking and untacking the horse, with the guidance of a staff member. A sidewalker is the volunteer that walks alongside the horse while the client is riding. The sidewalker is responsible for helping to keep the client safe and achieve the goals in the class. This sometimes will involve a safety hold of the client for an entire lesson. The sidewalker is an extension of the instructor, who helps to guide and coach the client through the lesson. A sidewalker must be able to physically jog alongside the horse. Volunteers need to be at least 16 years of age to help in our therapeutic classes. No, you do not need any prior experience to volunteer with us. We train all our volunteers, regardless of their experience, to help in our therapeutic classes. We will try our best to place you in a volunteer position that meets both your interests and strengths. Yes, we are required by Massachusetts state law to run a CORI (background) check on all volunteers and staff on property. New volunteers will need to complete the online signup, or alternatively, our hard-copy volunteer packet. In addition, we need a completed Emergency Medical Release form (renewed annually) and CORI (background check) forms completed in full. We will provide all the forms to you. Do I need to attend the training and orientation? I have a lot of horse experience. Yes, all new volunteers, regardless of their background, must attend a full training and orientation session. For weekly volunteers for Fall and Spring semester, we ask that you don’t plan on missing more than 3 times over the entire semester. For weekly summer volunteers we ask you don’t plan on missing more than 2 times over the entire semester. We usually have a few different options for summer programming, so you can volunteer as much or as little as you would like around your busy summer schedule. Please let us know as far in advance as possible if you need to cancel your shift. To cancel please call 781-259-1177 x30. Yes, we are open 7 days a week and hold lessons on the weekends. Do you have corporate volunteer opportunities? Yes, we welcome volunteer groups from companies. During your visit you will receive a tour of the facility, information on Lovelane and instruction from staff or volunteers on the way you can help Lovelane during your visit. For ideas on how your company can support Lovelane please contact Lisa Williams at Lisa@lovelane.org or 781-259-1177 x26.